The franchise, which played its first arena football season last year, is searching for local ownership. 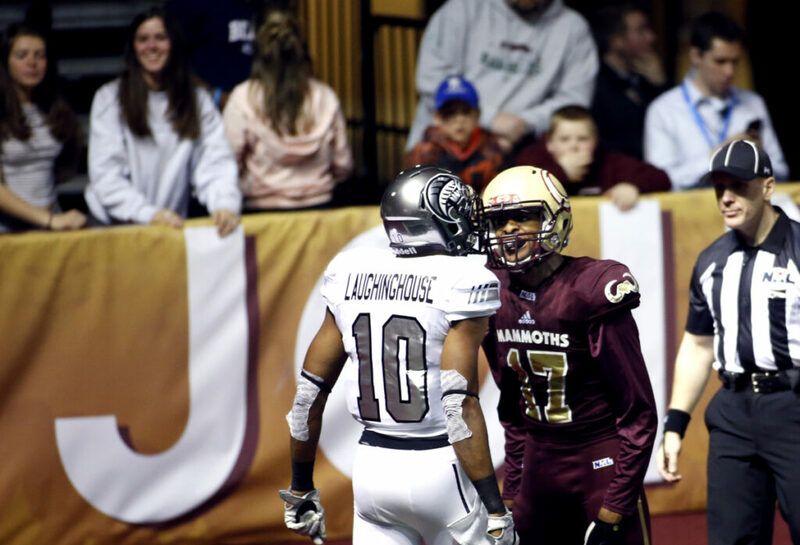 The Maine Mammoths will not play in the National Arena League in 2019. The team, owned by National Sports Ventures, the corporation that also owns the NAL’s Carolina Cobras, was put up for sale in November. An announcement on the team’s website Tuesday said the team will take a hiatus for 2019 so a local owner can be found. Refunds to season-ticket holders will be processed, according to the announcement. The Mammoths signed a three-year lease to play home games at Cross Insurance Arena, with a mutually agreeable option in December 2017 to renew for two years. Maine missed the four-team playoffs despite ending with a five-game winning streak to go 7-8. Attendance dwindled for each of the eight home dates in an April-to-August season. It peaked at 3,713 for the home opener and ended at 1,472. G LEAGUE: Jeremiah Hill scored 30 points to lead the Lakeland Magic (21-12) to a 130-101 triumph over the Maine Red Claws (11-21) at Lakeland, Florida. B.J. Johnson added 21 points for the Magic. R.J. Hunter scored 26 points and Andrew White added 17 for Maine. Lakeland, ahead 60-47 at the half, put the game away by outscoring the Red Claws 39-23 in the third period. WNBA: Maya Moore of the Minnesota Lynx decided to skip the upcoming season, seeking more time to devote to her family and faith. SPANISH LEAGUE: Lionel Messi returned to training, a day before Barcelona is home against Real Madrid in the first leg of the semifinals of the Copa del Rey. Messi was sidelined from Monday’s training session because of a right leg injury sustained in a league match Saturday. FA CUP: Wolverhampton Wanderers had to come from a goal down to beat third-tier Shrewsbury 3-2 in a replay of their fourth-round match, and fourth-tier Newport earned a home meeting with Manchester City by beating Middlesbrough of the second tier, 2-0. SUD DE FRANCE: Former champion Tomas Berdych made a winning return to the event with a 5-7, 6-3, 6-3 victory over German qualifier Matthias Bachinger at Montpellier, France. KVITOVA TESTIFIES: Australian Open finalist Petra Kvitova testified in the Czech Republic at the trial of the man who allegedly knifed her in her home. MAJOR LEAGUES: Houston Astros shortstop Carlos Correa and Tampa Bay outfielder Tommy Pham won their salary arbitration cases. The decisions gave players a 3-1 lead over teams in cases this winter. • Outfielder Curtis Granderson agreed to a minor league contract with the Miami Marlins and will report to big league spring training. COLLEGES: Former University of Connecticut men’s basketball coach Kevin Ollie lost a bid to stop the school from unilaterally ending arbitration proceedings related to his firing if he files a racial discrimination complaint against UConn. Federal Judge Kari Dooley in Bridgeport, Connecticut, approved a motion by UConn to reject Ollie’s request, deciding it was filed prematurely. Dooley didn’t rule on the merits of the request.